You are making writing mistakes. Oh, betcha, everyone does. You’ve done your editing, but still, some minor issues are occasionally found in your texts here and there. What’s more, typographical mistakes are horrible for your readership rates. Your readers can pardon some minor mistyping or grammar issues in your blog. However, while most readers are at least somewhat concerned about typos, some viewers literally can’t stand it. In the meanwhile, why would you even take a chance of making mistakes in the first place? 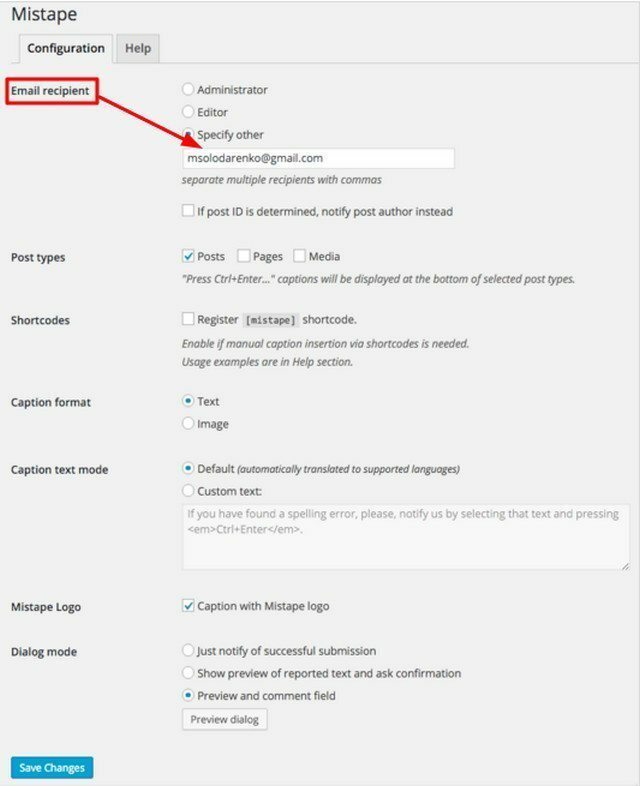 If you seek to keep your blog perfect, Mistape, free error notification plugin for WordPress, can lend you a helping hand. Mistape has proven to be convenient to operate and set-up for WordPress blogs. 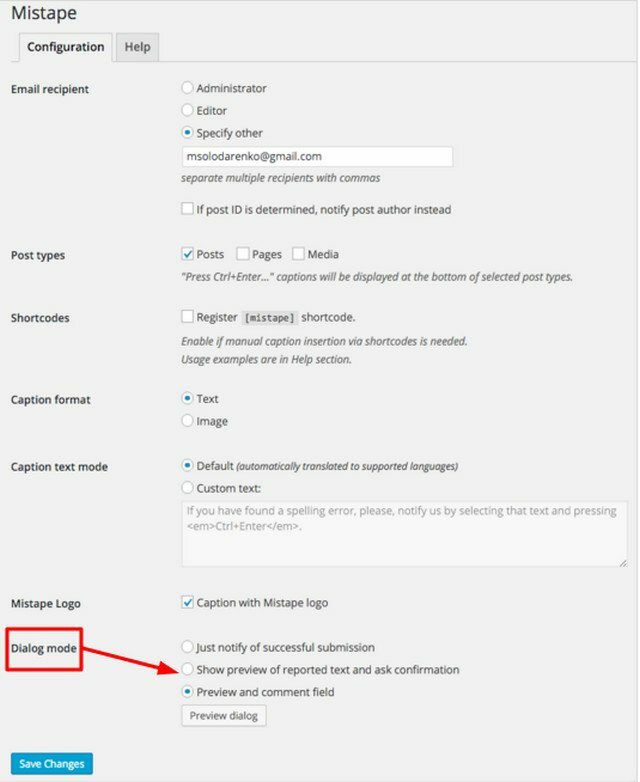 Its aim is simple: supply readers with a tool to notify website’s admin on typographical or any other writing mistakes found in content. In a word, readers’ brains and knowledge team-up to get rid of errors in your texts. With Mistape blog readers are granted the way to assist an author, help him/her to improve the writing. That is, it boosts the level of communication, trust, and readership for your website. The great thing about the plugin is that it can be easily integrated into your blog. Oh, it has to be underlined, Mistape is completely free, and you can start using it right now. You can effortlessly download the plugin from the official WordPress plugin directory by following this link or search for it right from your website’s admin page. After the installation of Mistape, you can choose the email address all notifications will be forwarded to, and it’s not necessarily the email of an admin or editor. You can choose any email you want to. Only let a reader know on the successful submission. Show preview of error notification and ask for confirmation. Notifications are emailed straight off. It’s easily set up for your WP website. You can start using Mistape right after the installation. If you want to change anything in its behavior, you’re welcome to tune any parameter of the plugin in the “Configuration” section. It is a plugin, no strings attached. You just get error notification emails from your readers. Point. You can remove outside references by making elementary adjustments in the “Configuration” section. If you are into heavy customization, you have all the hooks you might need available. You can allow your users leave a comment for the highlighted fragment they report. The best way to show usefulness of the product is to listen to the users. Just within several months Mistape was downloaded for 1,5 K+ times. Around 12 new sites get it installed every day. In addition, developers of the product don’t stop on what they’ve done so far. Being launched in August 2015, Mistape has been significantly improved by now. Support page of the plugin is continuously monitored, users’ queries are answered, and the plugin gets adjusted. To sum up, while there are other WP error notification systems on the market, Mistape appears to be an effective all-in-one replacement due its user-friendliness and reliance at work. Best Free Logistics WordPress Plugin for Transport, Shipping 2016. Best WordPress Gamification Plugins for Building Your Customer Engagement. Best WooCommerce Plugins for Marketing 2016. Top 10 WordPress Plugins For eCommerce Solutions. WordPress Dating Themes & Plugins to build dating website.